Many kids look forward to summer camp; it’s a time for new friends, good times, and camp food. Unfortunately, not every camper comes home healthy. 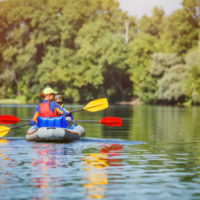 Just what can parents expect, and what precautions can they take to ensure a safe, happy experience for their little campers? Campsites have trees. Trees are magnets for many children. According to the Centers for Disease Control and Prevention, more than half of camping injuries involve falls. Many of them occur along trails, but recreational equipment, vegetation, and rocks can also be associated with falls. Additionally, games and activities can lead to a tumble or two. While no amount of supervision can prevent all catastrophes, it is important for parents to assure themselves that children will be properly supervised at all times, so that if an accident does occur, injuries can be quickly taken care of. Roughly 15 percent of summer camp injuries are cuts, which obviously occur while using kitchen tools and other camping gear. Camp counselors should be sure to instruct children on the proper use of these items, and keep dangerous tools out of reach of unsupervised campers. What’s a camping trip without a mosquito or two? Sadly, some unlucky campers may have run-ins with snakes, spiders, and other unfriendly critters. Another unfortunate experience involves toxic foliage like poison ivy. Ointments and salves can help with these issues for the most part. Sunburns are only part of the camp out distress. Far too many injuries occur around the campfire, often because kids become too playful and don’t recognize the seriousness of fire safety. Sometimes, something completely unexpected may befall your child while at camp. For instance, over 30 campers and some camp counselors fell ill at a Lake Placid camp this summer. Investigators are still looking into the cause. Do a thorough background check and make sure you’re very comfortable with the people running the program, the schedule of events, and the mission of the camp before sending off your little one. At the Law Offices of Robert W. Elton, we hope all of your summer adventures are just what you’re hoping for. In the event you or a loved one experience serious injuries due to the negligence or recklessness of another individual, our experienced legal team will work to ensure justice is served. Contact us in Daytona & Ormond Beach today for a confidential consultation.